Here in Charlotte I am very fortunate to be the first call player for many of the touring Broadway shows that come into town. Sometimes these shows are self contained which means they carry a drummer and percussionist with them. Most of the time a show will travel with a set player, which means that I become the percussionist. These can be some of the most challenging jobs any musician will ever find himself on. Modern Broadway shows can be extremely complex and there is just usually just one rehearsal for you to get your act together. Sometimes if you are lucky you will get an advance book (a copy of the music), which can be a lifesaver. I always try to obtain a copy of the original cast recording so I am somewhat familiar with the show. These recordings are almost always edited from the stage version and do not necessarily reflect the correct keys and arrangements. 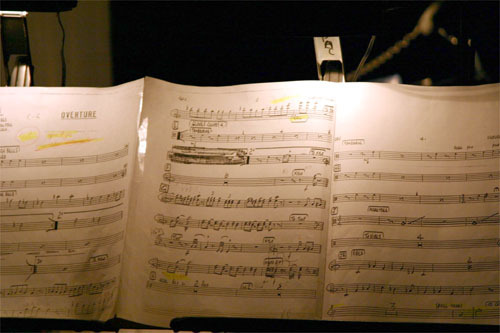 They are also usually missing much of the incidental music which can be the trickiest charts in the show. I average about 4 or 5 of these shows a year and they last anywhere from one week to a month. Since a percussionist is playing so many instruments doubling pay is in order and this adds up to a nice chunk of change. Be aware though that the traveling conductors can be merciless so you better be able to play and sight-read extremely well or you will be in big trouble! 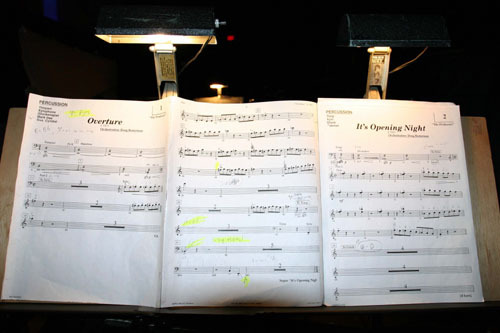 Keep in mind that there is almost always just one four hour rehearsal for the show on opening night. Just this past fall I was fortunate to play two shows within a six-week period. The first was a newer musical called The Producers. This was the first national tour of this show so no expense was spared in the production department. Friends who saw the run tell me that the orchestra mix sounded like a CD recording. This is a GREAT show. It is extremely funny and the orchestrations are fantastic. There was never boredom factor -- even after two weeks. The show was also one of the more difficult books I have had to play in a while. 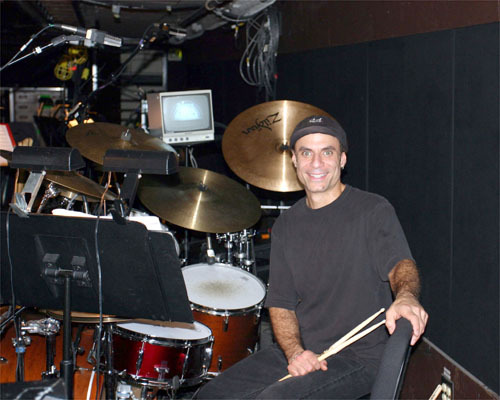 Like most Broadway percussion books there are some very fast instrument changes but this show also has lots of solo percussion parts not to mention some VERY fast mallet licks. There are also some important typewriter solos and tap dance reinforcement that the conductor was rabid about. This is usually the way it is. You can nail the most difficult mallet and timpani parts but the most important thing to the conductor is that silly tambourine part. So make sure you figure out what parts he likes to hear the most and look right at him during these moments. He will love you for it. The second show was the well-known Joseph and the Amazing Technicolor Dream Coat. While not one of my favorite shows (not by a long shot), this show has a few interesting moments and it contains some setup challenges. The setup is the most important aspect of your performance so you will have to have some sort of plan to begin with. Below are some pictures and descriptions of the setups for these two shows with some hints for instrument placement. Above is a top view of the setup for The Producers. Since this is a heavy xylophone show I brought a Deagan Artist Special 4 Octave instrument. As well as having very wide bars this xylophone has tremendous projection. There are no notes below the middle B natural in the parts so I am using the bottom octave as a mallet tray, which is very convenient. There are a few numbers with alot of vibes so I have set up a small mirror so I can see the conductor when my back is to him. 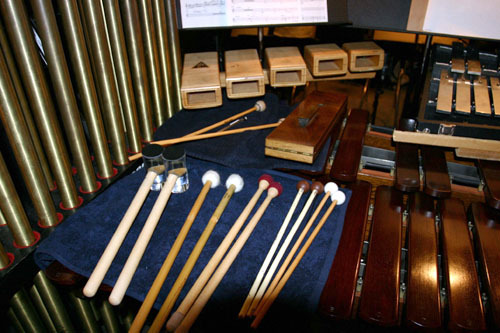 As is the norm there are many very quick instrument changes, especially from Timps to the mallet instruments, so most of the timpani parts are read from the main mallet stand. The show could be played on 3 timps since there are some low Eb�s but space constraints and instrument changes make this difficult. Most shows can be done with two timps as long as they are good drums and you have that split second to do some extra tuning. 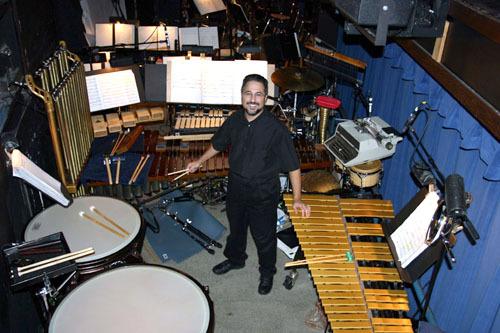 I always use the stacked setup with bells and xylophone so I can read off of one stand. I will also make copies and enlarge them so I can see from a distance. It is important for the first few nights not to go crazy with a bunch of different mallet changes. I keep it simple until I know the show better. There is nothing worse than missing a part because you a holding the wrong mallet. Over the years Mike Balter has made me a number of double-ended mallets (timp. 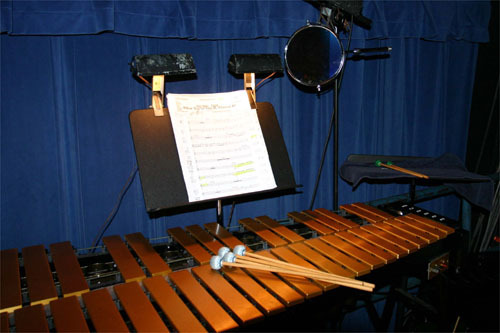 and xylophone for example) that have been a godsend. 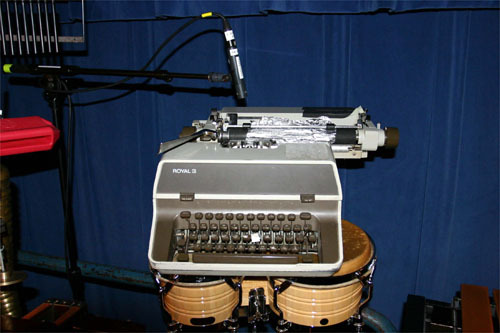 Since there is limited room in the pit I put the typewriter on the bongos for the tunes in which it is featured. I worked with the sound tech to make sure mic placement was not an issue. 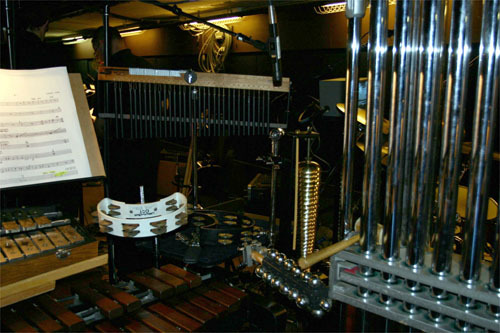 Chimes can be the most difficult instrument to place. They are large and difficult to play from a distance. What I usually do is put something heavy on the pedal and leave the tubes in the open position. This way I don�t have to worry about getting to the pedal if I don�t have time. I dampen with my hands. Here I have placed the chimes right next to the xylophone setup since there are quick changes between the two. 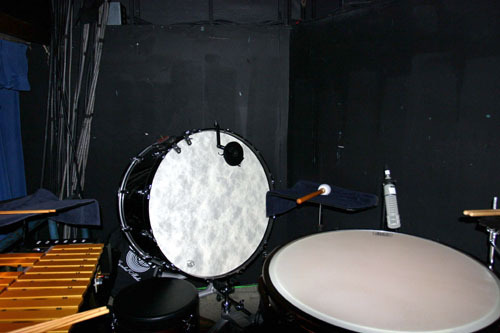 The concert bass drum didn�t fit in the picture but it is located in the back between the timps and vibes. This is the main stand. The overture is up and you can see some of the xylophone licks. Everything is in cut time and is extremely fast. Here is a close-up of the xylophone mallet tray. Notice the slapstick, which is featured quite prominently. 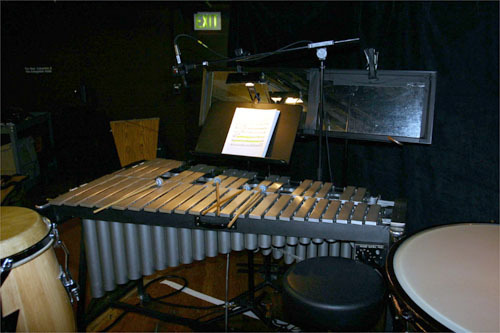 Here is a close-up of the right side percussion setup. There are many triangle, ratchet and bell tree solos so these instruments need to be in direct sight of the conductor. Here is the Bass Drum. I had to get to this fast and it was quite a jump. Most of the time I was playing it behind my back. Luckily it�s a large target. Here is the typewriter. You can see how close the mic is since your average typewriter doesn�t put out allot of volume. I�m so glad I took typing in high school. Who knew! The mirror is an essential part of your setup. It will enable you to see the guy waving his arms no matter where you are. You can also grab a quick shave if needed. Here is a view from the top of the setup for Joseph and the Amazing Rain Coat. 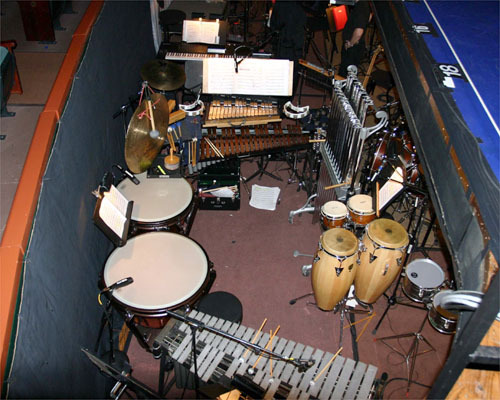 As you can see the Timpani placement and the Xylophone-Bell stack is similar to The Producers setup. There is lots of gong (both hits and rolls) so it is important that I have fast access to it. Here I have placed a large 28� Wuhan wind gong above the timps to my left. It is close-miked so the proximity effect (added low end) of the cardiod microphone make-up for the low end this type of gong usually lacks. This is more of a hand percussion type of show and you can see the congas, bongos and timbales to my right. There are also some very important chime solos so I have placed the chimes to my immediate left where I have access to the pedal. 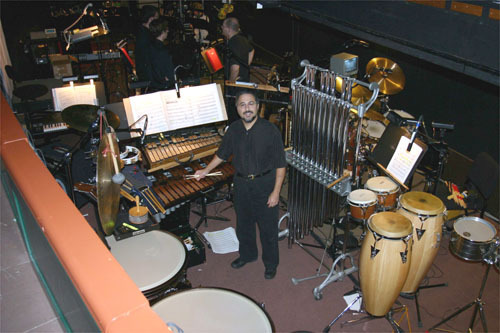 The vibes didn�t make it into this picture but are behind the timpani (see below). 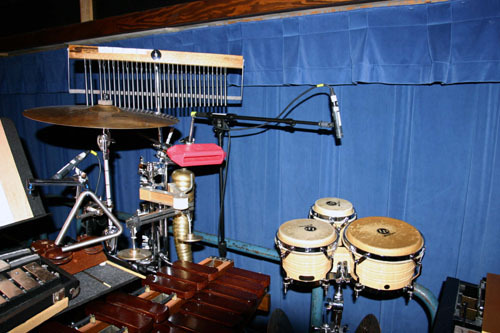 You can also see the drum set that the traveling drummer uses behind the chimes. It�s always nice to have the set drums close by in a groove-oriented show like this one. Below are some close-ups of this setup. Here is the main stand with the overture up. If you look closely you can see some of the fast instrument changes. The music for this show was in pretty bad shape as far as readability. It is sloppily hand written and the cuts are either crossed out or hand spliced. This makes it a pain in the neck to read the show and is not all that uncommon. You would think that if a production company wants good results from a local orchestra they would spend some money to have the parts professionally prepared. Oh well. Here is a shot from the rear of the setup. You can clearly see the bongos, which are stacked above the congas. I used a small Deagan xylophone on rental (with most of the other stuff) from the Charlotte Symphony, which was off that week. This helped create space for all the stuff on my left. 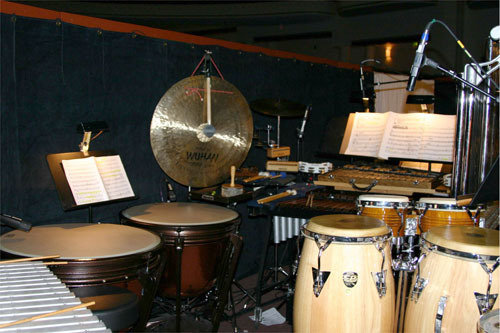 Here is a picture of the percussion setup directly to my left. I used two mounted tambourines (one to my left and one to my right) as well as a hand held one. I did this so that I could get to the tambourine no matter where I was at the time. I would say that tambourine parts make up about 60% of the book -- woo-hoo! The gong is in clear view and I have mounted a mallet to the stand so I can get to individual hits quickly. 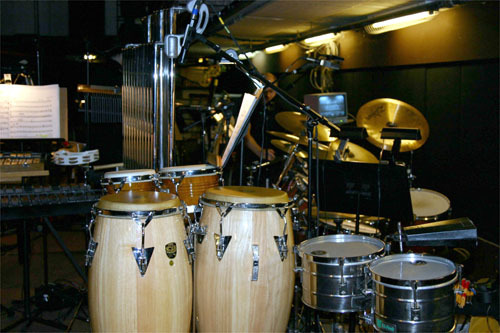 Here is a shot of the Latin percussion setup, which is featured quite prominently in the show. I chose to use a set of small timbolitos instead of timbales since they tend to stay out of the range of the drummers toms. It is VERY important to wear earplugs in a rock show such as this one. It gets unbelievably loud in the pit. Here is a shot of the vibe setup. Since my back is to the conductor when I am playing them I have put a large mirror on a stand in front of the vibes. Be sure to tell the conductor you will be doing this so that he won�t freak out when he looks at you with a cue and your back is to him. 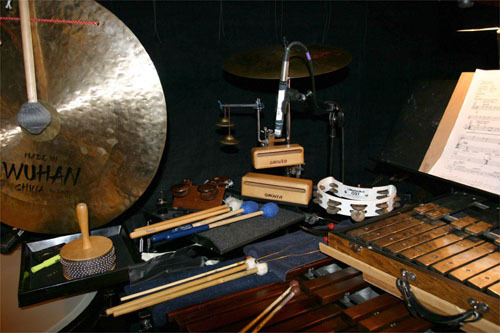 Here is a picture of the right side percussion setup. Notice the mounted sleigh bells, which are a necessity since you are playing chimes and sleigh bells at the same time. This is Mark -- the drummer. The video monitor is so he can see the stage action. He also plays to a click during parts of the show, which feature some sequenced music. This is a full setup shot from above the pit. Looks like fun doesn�t it?